Victoria Holloway, FDR’s Consumer Insights Manager, recently had the opportunity to present to students at a local high school to discuss the market research process and different methodologies. 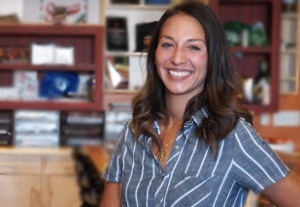 (A big shout out and thank you to Arapahoe High School’s DECA & Marketing teacher, Mrs. Erin Grantham!) At the end of the presentation, students participated in a triangle taste test to see if this group of Gen Zers could differentiate between a generic brand of cheese puffs and a major named brand. What Is a Triangle Taste Test? A triangle taste test is a discriminative method commonly used in sensory research. Wait, what is a discriminative method, you ask? A discriminative method is a type of analytical method. But wait, what is an analytical method? Let’s backtrack to Sensory Research first. Sensory evaluation can be broken up into two primary categories, analytical and affective/hedonic. Analytical methods refer to an objective assessment about a product. Which sample is saltier? Which sample is different? Whereas affective/hedonic methods refer to a subjective assessment. Which product do you like? Which product do you prefer? Analytical methods are an umbrella for two types of methods – discrimination and descriptive. Discrimination can sometimes be referred to as difference testing. This testing is designed to answer the basic question of, “overall, are the samples different?” Triangle, duo-trio, and paired comparison are the three main methods of discrimination. Triangle requires a minimum of at least five participants in order to state if there is a significant difference, whereas duo-trio and paired require at least seven participants. 1. Paired comparison is used when there is a known difference. For example, you would ask the participant to identify which sample is sweeter. Paired comparison will have two coded samples (A/B, B/A). A company could use this method if they were trying to understand if the type of sugar used has an impact on senses. 2. Duo-trio is used when comparing to a reference. For example, you may have a control juice, and will then compare the control (reference sample) to two coded samples (A,B). A will be the same juice as the reference sample and B is the juice being testing. Participants will taste the reference sample first, and would then taste A and B and then decide which sample (A or B) is the same as the reference sample. A company could use this method if they were trying to understand if there was a sensory difference with how the juice was processed with different fruits. 3. And back to the main question – what is a triangle taste test? Triangle method is used to determine if an overall difference exists between two products, using three sample where two are identical. This method tends to be preferred for sensory evaluation because it can require fewer testers, and the likelihood is greater that the result is genuine and not due to a chance effect. A company could use this method if they were changing the formula to a beverage to lower costs, and wanted to know if the participant is able to differentiate the overall taste/flavor. 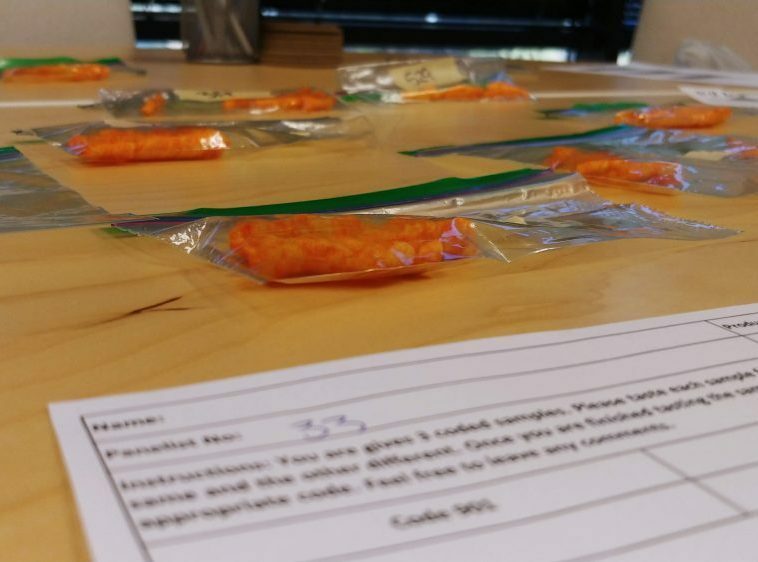 At Arapahoe High School, a total of 21 students participated in a triangle test to evaluate a generic brand vs a major named brand of cheese puffs. Each student received three samples. Either they received two of the same generic sample and one major named brand sample or received two of the same major named brand sample and one generic. Of the 21 students, 13 were able to identify the “different/odd” sample. What does this mean exactly? Using statistical tables, we determined there was a significant difference. At a confidence level of 95%, we statistically stated that THERE WAS a significant taste difference between generic and named brand cheese puffs, at least when testing among this group of Gen Z (note that ages ranged between 15-18 years-old and 30/70 male/female) respondents. Maybe next time you are at the store, you will think twice when deciding between generic vs named brand cheese puffs.